Different players make different mistakes, but I have found several major mistakes that players tend to do from the ready position. There are 3 main mistakes and several other mistakes players make from the ready position. This reminds me of a sumo wrestler. 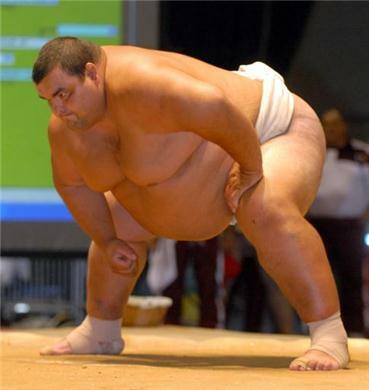 Sumo wrestlers do this because they do not want to be moved, getting low lowers their center of gravity making them better balanced and more stable. 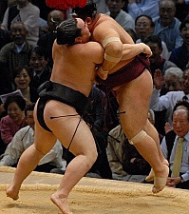 Usually the wrestler who ends up higher ends up losing because they can be moved much easier. Many players bend their knees and back too much because they see the pros on television doing this as they wait to return a serve. Here is an example of Novak Djokovic waiting to return a serve. What the viewer usually doesn’t see is that as the television camera switches its attention to the server (as does the viewer) the returner will actually come up from that position into a much higher ready position. Hover over the below image to see Djokivoc come up. The first thing someone crouching down must do to run quickly is straighten their body. This can easily be demonstrated by finding the slowest person you know and challenging them to a race. You must stay in a crouched running position and they can run any way they want. My bet is you will lose. To run faster, increase the height of the bodies center of gravity. Keeping the back straight gives a higher center of gravity. Look at this picture of a sprinter. Notice they are running with their bodies and back relatively straight and slightly leaning forward. Another big mistake players make with the ready position is keeping their elbows too close to their bodies or keeping the elbows too low. Since the swing starts right after the ready position the body and racquet should get in the proper position during the ready position. The elbows needs to be up later in the swing so they might as well be up now while there is time to get them up and while the body is not needing to move in other directions. Moving the elbows away from the body or higher later into the swing is much more difficult to do when other parts of the body will be moving in different directions. Because of the difficulty involved with doing this, most players will just leave the elbows in the position they are in during the ready position. If they are in the wrong position while in the ready position, they will stay in the wrong position throughout the swing. If the elbows are too close to the body during the ready position and not raised up correctly later in the swing the racquet will potentially be open, or laid back, as it is much easier to move your wrist with the elbow down. A laid back racquet will put the racquet head out of sync with the rest of the body causing a potential great loss of balance as the swing continues and a loss of power as the ball is hit. This also make it difficult to get the racquet vertical at ball impact without moving the wrist. Or, if the wrist is not readjusted and the hitting elbow stays down, the arm will be forced to stay bent during the forehand swing. Too much of a bend in the arm will lessen the overall swing radius making the ball contact point closer to the body making the swing less powerful. It also keeps the hitting zone from being as far out in front of the body as it should be. With the hitting zone not as far out in front as it should be there is a potential for part of the body to be in front of the ball during contact. This will also severely limit the power of the swing. Elbows too low will keep the wrist too straight and not give the 30 degree bend needed to properly hit a forehand. This will also put the hitting zone too close to and not enough out in front of the body and once again, limit power. The third major mistake is not centering the racquet. Players tend to carry their racquet off to one side. Right hand dominate players will tend to carry the racquet tilted off to the left and left hand dominate players will tend to carry the racquet tilted to the right. Most players carry the racquet to the side that makes their forehand swing elongated since the racquet will have a greater distance to travel. This can be especially problematic on faster courts or against better opponents who will tend to hit the ball faster and harder. For backhands, a much smaller overall swing is needed. This difference in swing lengths can mess up the timing and rhythm all good tennis players need to be successful. Forehand swings will either need to be started earlier than backhand swings or the speed of the swing will need to be increased since there is a greater overall length that it needs to travel..
An uncentered racquet can also lead to unnecessarily swinging the racquet as the racquet will tend to be lowered as well as be uncentered. Most players who end up having to bring their racquets up to the proper loop position end up swinging the racquet to get it into the proper position instead of just rotating the shoulders and hips.